The patriotic spirit of ‘Quit India “Movement in the year 1942 inspired him to discontinue his college career and actively participate in freedom struggle .He visited various places to unite the youth to fight for the freedom of the nation. In the 1946, at a very young age of 26 he won the election of the then legislative assembly of Vadodara state with clear majority and was the youngest member in the assembly. He then successfully as a member of the legislative assembly of Mumbai in the year 1952 from Mansa /Vijapur constituency. He played significant role in passing the bill for establishment of Gujarat University .He remained as an active member of the senate of the Gujarat University from 1952 to1957.He was once more successfully elected as an M.L.A in the elections of the 1962 carried on the activity of the social reforms. In the begning of the decade of seventies he concentrated his efforts to the field of education and co-operatives. 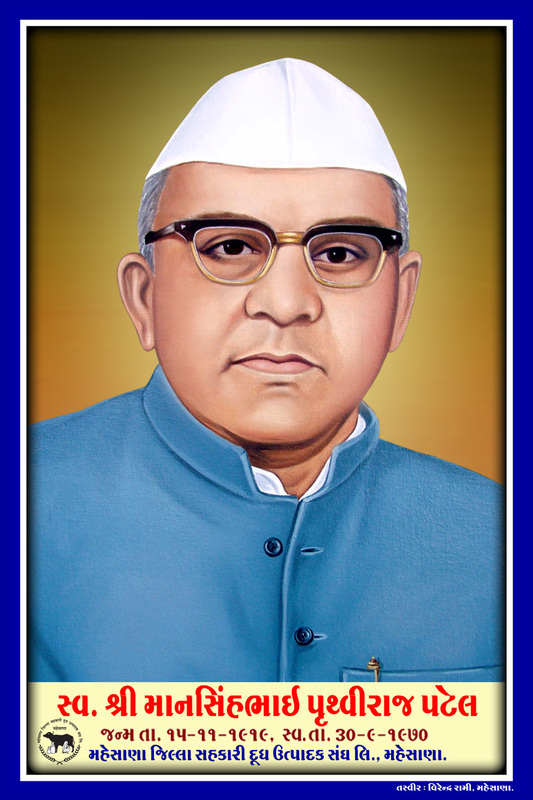 He played an important role in establishment of Mehsana District Co-operative Milk Producers Union. He also actively participated in the co-operative services of the Gujarat Co-operative Union as its member. He was also deeply involved in the educational reforms and headed the primary educational reforms and visionary committee of the district. He also served the North Gujarat Higher Secondary education society in the Pilval College as a Vice President. He also contributed to a great extent in providing primary educational facilities and modern educational facilities in his native place Charada in Vijapur Education. One of the dreams of our founder-Chairman was to supply milk from Mehsana to Delhi. Today, the dairy cooperatives of Gujarat are marketing around 25 lakh liters of milk each day, in Delhi and NCR, of which the bulk is supplied by Mehsana Union. We remain forever grateful to our Founder Chairman and are duty bound to take this movement forward in the best interest of our Producer Members who are most small and marginal farmers and landless labourers.